San Francisco, CA – A San Francisco woman, who was beaten senseless with a metal doorstop by her boyfriend and later charged with attempted murder after fending off a second attack, was acquitted on all counts Wednesday afternoon. The incident began on April 25, 2007, when Whitney Keith Bearchild attacked his girlfriend, Drusilla Bailey, and beat her with a metal doorstop. A neighbor, responding to the commotion, called 911 after pulling Bearchild off Bailey. Bailey was immediately transported to San Francisco General Hospital where her injuries were photographed and she received 12 staples to her head. The San Francisco Police Department failed to conduct any investigation into the attack on Bailey and never interviewed their neighbor. As a result, Bearchild was not charged and returned to the home he shared with Bailey before her emergency protective order expired. One week later, on May 4, 2007, the day that Bailey was to have her staples removed, Bearchild attacked Bailey again, striking her on her head. Bailey knew that the same metal doorstop he had beat her with before was still in the room and within his reach. In self-defense, Bailey grabbed a 3” paring knife and started swinging, causing four small puncture wounds to Bearchild’s neck, forearm, and thigh. Bailey was arrested about 30 minutes later. Bailey was initially charged with attempted murder, but not held to answer to this charge at the preliminary hearing. She was ultimately charged, tried and acquitted of assault with a deadly weapon, a strike, as well as five lesser-included offenses. At trial, Bailey testified that she had acted in self-defense. Bearchild was granted immunity in exchange for his testimony and will never be prosecuted for his attacks on Bailey. The mission of the Public Defender’s office is to provide vigorous, effective, competent and ethical legal representation to persons who are accused of crime and cannot afford to hire an attorney. 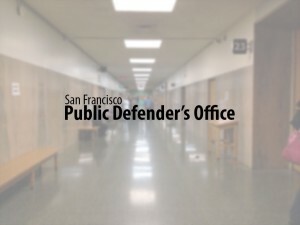 Established in 1921, the San Francisco Public Defender has a long, proud history of providing top-notch representation to its clients, and championing programs that help people turn their lives around.